Kafka Granite has a team of knowledgable sales representatives eager to help you with your next project. For more information or to request samples, please do not hesitate to contact us. If your phone no. is outside of the U.S. please enter it in the project information box below. Subscribe to our mailing list to receive the latest news on Kafka Granite. Loading hours may vary. Please call office for loading times. Does your company manufacture precast concrete, epoxy resin, or other natural stone products? We will work with you to meet your company’s unique specifications and quality control standards. Contact us for more information, pricing or complimentary samples. Are you an Architect, Landscape Architect, Engineer, Designer, or Contractor interested in learning more? We would be happy to provide your team with a free informative Lunch & Learn presentation. Contact us to schedule your presentation today! Kafka Granite is always looking to expand their distributor network. Do you supply landscape stone, boulders, mulch, pathway materials, or stacked stone veneer at your store? 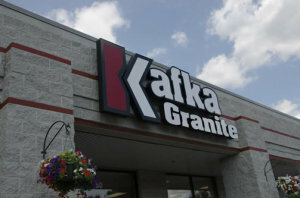 Kafka Granite can be your one-stop shop! Contact us today to get started!